Oct 27 – Termites! – Trees & Flowers & Birds! Isn’t that pretty? 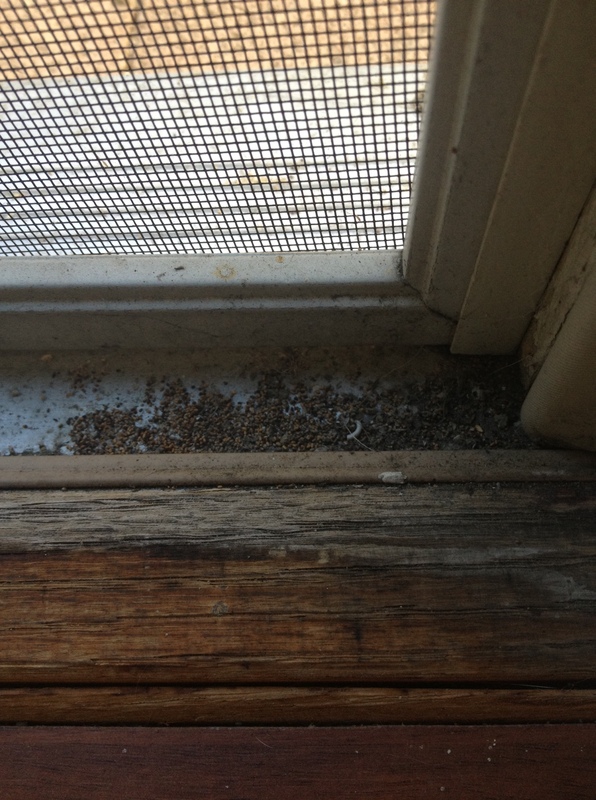 That’s termite sawdust…inside the door frame of my french doors. They are pretty well established in the trim around the whole house. Door trim, roof eaves – everywhere. My shared wall neighbor had her house painted and these same trim pieces replaced and they were just covered in bugs and pretty much crumbling in their hands. So, that’s how my Saturday started – meeting with the painter and him showing me on my side where the damage is more visible – knowing full well that just because some places don’t look as bad, you know they are there. So you might say I have a case of the creepy crawlies right now. Doesn’t help that while I was looking around the house after he left, I moved an outdoor foot mat and uncovered a family of crickets. One of whom I later found IN the house. No wonder the cats have been freakier than usual! Given the obvious infestation I am just going to have to bite the bullet and tent the place sometime in the next two months. The painter will come in January and finish my side of the outer walls, replace the damaged wood trim, paint my stucco wall and stain my side of the new fence. Meanwhile I am going to vacuum every corner of every window and door frame and take multiple showers to remove this feeling that there are things crawling all over the place!